Look what we got in the mail this week! Pop It! Top It Snickerdoodle Popcorn! Two words. I DIE! 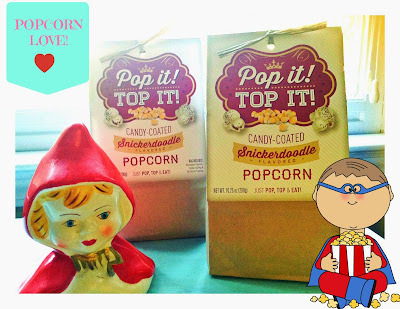 This popcorn has white chocolate, candy coated, fresh made popcorn, and top-secret Snickerdoodle flavor bits that come together in an almost addicting way! This is the THE P-E-R-F-E-C-T Christmas snack and is available online at North Aire Market. Each box contains enough microwave popcorn, white chocolate candy coating, and Snickerdoodle flavors to make 8 servings. All the good stuff you need to make it is right in the package. It's a sure way to easily make a fresh, delicious treat that your friends and family will love. Make sure you order plenty because it will dissapear in a matter of seconds. Is just that good! Disclosure: I received a sample for the purpose of a review. I was not compensated for this post. All opinions expressed are 100% my own.